The term Burgher was defined by Chief Justice of Ceylon, Sir Richard Ottley, in an authoritative pronouncement, when he gave evidence before the Commission which was appointed in connection with the establishment of a Legislative Council in Ceylon in 1883. He stated that, “The name Burgher belongs to the descendants of the Dutch, Portuguese and other Europeans born in Ceylon, and the right to distinction must not be decided by the country from which their father or paternal ancestor came.” This established the community as distinct and identifiable nearly two centuries ago. 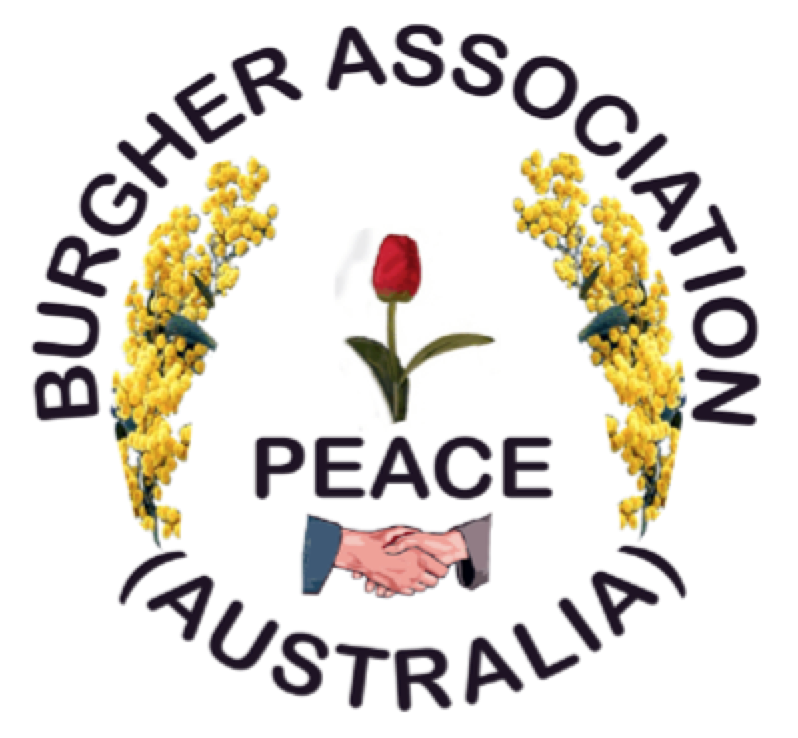 The emblem of the Burgher Association (Australia) Inc., as depicted on this website, has been constructed to reflect the origin of the Burgher Community and its present place in Society. It shows our Community name and below it is a Tulip which is the National flower of the Dutch. ‘Peace’ as signified in the emblem by both the usage of the word and the shaking of hands between a Female and a Male of different coloured attire. The acknowledged fact that Australia has the largest Burgher Community in the world is manifest in two sheafs of wattle the Australian National Flower, safeguarding the core characteristics of the Burgher Community which is Peace through tolerance and harmony encouraged by racial mix which will and can only enhance and increase the intensity of Multicultural Australia.